Have you woken up suddenly in the wee hours of the morning, with a sudden excruciating pain in your foot, so much so that even the slightest movement of the sheet over it is giving you distress? Be warned, you might be having your first brush with an attack of gout! Homoeopathy can help. 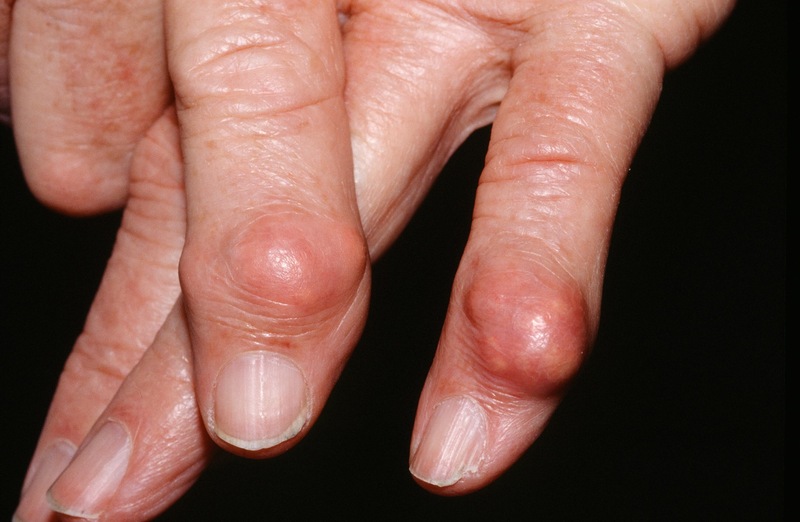 Gout is one of the most painful form of arthritis. It can cause an attack of sudden burning pain, stiffness, and swelling in a joint – usually a big toe – but can occur in your feet, ankles, heels, knees, hands and wrists too. Uric acid is a breakdown product of purines that are part of many foods we eat. An abnormality in handling uric acid by our body can cause a ‘uric acid overload’ resulting in attacks of painful arthritis (gout), or kidney stones, or blockage of the kidney-filtering tubules with uric acid crystals, leading to kidney failure. Many people only develop high blood uric acid levels (asymptomatic hyperuricemia) without having any symptoms of gout. The exact cause of hyperuricemia sometimes isn’t known, although inherited factors (genes) seem to play a role. Your chances of getting gout are higher if you are overweight, drink too much alcohol, or eat too much meat and fish that are high in purines. If you are on diuretics, watch out, they can also bring on gout. It’s most common in men. Women are usually protected because of female hormones, and tend mostly to develop gout after menopause. Sudden, intense pain in a single joint, typically the big toe or ankle most usually happening at night, waking you up from sleep. It might soon be followed by swelling, redness and a feeling of warmth/burning (inflammation). You might feel your joint very hot. This symptom is called podagra. The pain is most severe within the first 12 to 24 hours after it begins. The symptoms may get worse quickly, last for hours, and your joint may get so tender that even light pressure from a sheet is intolerable. The skin around your joint may turn very red or purple. There is limited movement (stiffness) in the affected joint. In extreme cases alternating chills and fever may also be present. A severe attack may last for days or weeks to months followed by gradual but total disappearance of all symptoms, until the next attack. It’s important to see your doctor even if your pain from gout is gone. Many people have a second attack within 6 months to 2 years after their first attack. If neglected, over time, gout attacks may occur more frequently, involve more joints, have more severe symptoms and last longer. The buildup of uric acid that led to your gout attack can result in harmful permanent deposits of lumps of uric acid crystals called tophi in your joints and tendons. 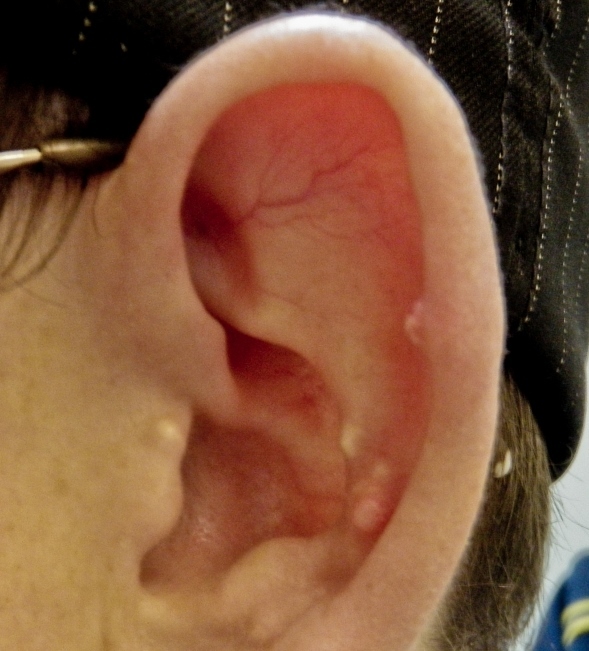 Longstanding hyperuricemia can have uric acid crystal deposits in other tissues as well, most common being under the skin of your ear lobe. There are three stages of gout though many people never experience the third stage due to advancements in the early treatment. In the first stage you have high uric acid levels in your blood, but no symptoms. Uric acid levels may stay the same, and you may never have symptoms. Some people may have kidney stones before having their first attack of gout. In the second stage uric acid crystals begin to form, usually in the big toe. You begin to have gout attacks. After the attack is over, the affected joint feels normal. The time between attacks may grow shorter. Your subsequent attacks may get more severe, last longer, and involve more than one joint. In the third stage, symptoms may never go away. They may affect more than one joint. Gritty nodules called tophi may form under your skin. Without treatment, the tophi may form in the cartilage of the external ear or the tissues around the joint (bursae, ligaments, and tendons). Progressive crippling and destruction of cartilage and bone is possible. The condition requires a medical diagnosis. Your doctor will ask questions about your symptoms and do a physical examination. The doctor might need to do a blood test to measure the amount of uric acid in your blood. 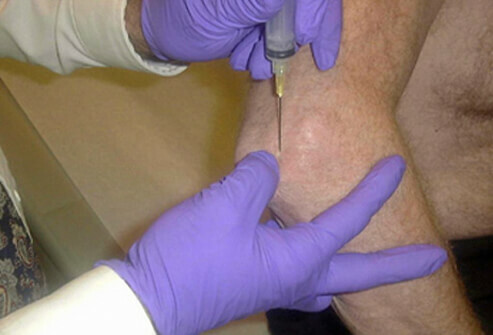 A sample of fluid from your joint – arthrocentesis, though not always necessary might be taken to look for uric acid crystals. This is the most confirmatory way to test for gout. During an acute attack, non steroidal anti-inflammatory medicines (NSAIDs) can help to relieve pain and shorten the duration. Your doctor may prescribe a higher dose of NSAIDs initially but it carries a risk of stomach pain, bleeding and ulcers. Moreover taking aspirin (an NSAID) is not advisable. It can make gout worse by raising the uric acid level in the blood. He/she can also give you colchicine or a shot of corticosteroids if the symptoms are severe or you can’t take NSAIDs (if you are on blood thinners). Gastrointestinal side effects of colchicine if given in high doses, limit its use. Side effects of corticosteroids may include thinning bones, poor wound healing and a decreased ability to fight infection. To ease the pain during a gout attack, rest the joint that hurts. 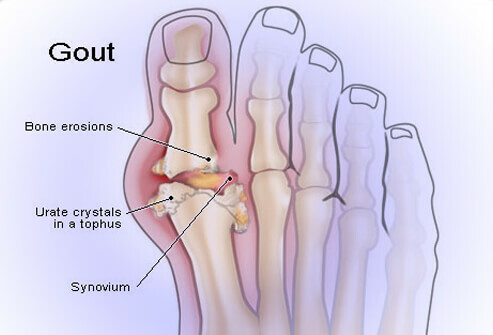 Relief from a gout attack often begins within 24 hours if you start treatment/management right away. Paying attention to what you eat may help you manage your gout. Eat moderate amounts of a healthy mix of foods to control your weight and get the nutrients you need. Your gout diet should be high in complex carbohydrates and low in protein. Maintain a diet low in purines: Watch your daily intake of organ meat, seafood and alcohol (especially beer). Also limit intake of caffeine, cauliflower, dried beans, lentils, peas, oatmeal, spinach and yeast products. They may provoke acute attacks. Consume plenty of water and other fluids as this promotes the excretion of uric acid and prevents development of kidney stones. Regular exercise helps minimize the frequency of attacks. Your homoeopathic doctor will select a remedy not only based on your physical symptoms, but also your lifestyle, mental and emotional state, stress levels, diet, family history and other general factors in totality in order to prescribe the remedy best suited to you. Homoeopathic treatments are highly individualized. 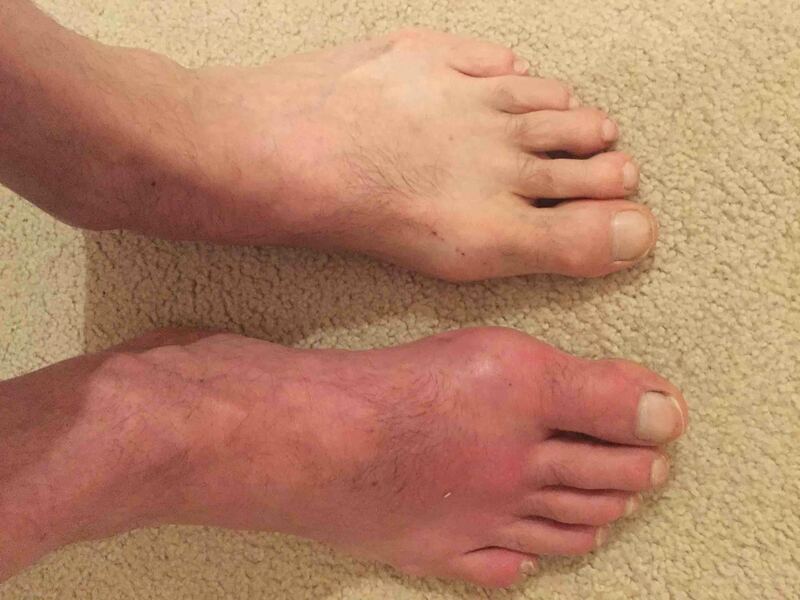 Two different people with gout are treated as distinct individuals, each uniquely influenced by the many factors mentioned above. Each patient is prescribed a remedy that matches his/her symptom totality. There are many acute par excellences like Arnica, Belladonna, Colchicum, Ledum Pal, Benzoic Acid, Sabina, Lycopodium etc for the excruciating burning pains of gout. Colchicine (Colchicum), when used homoeopathically can cure gout in patients with gastrointestinal symptoms. The remedy Urtica urens is said to cure more cases of gout than any other. Under its use pain and swelling subside and large quantities of sand are passed in urine bringing down your uric acid levels. Ammonium phosphoricum, Antim Crudum and Lycopodium are used in constitutional gout where there are nodosities in the joints. Antimonium crudum is easily selected by its gastric symptoms in addition to the gouty nodes. Distinguishing urinary symptoms with high colored offensive urine would suggest Benzoic acid; while much of red sand in urine, chalky gouty deposits in the joints and a possible concurrence of kidney stones is Lycopodium. Berberis vulgaris is indicated when there are sudden twinges of stitching pains in gouty joints and like Lycopodium, the person has a tendency towards kidney stones too. Rhododendron has proved its worth in gouty swelling of the big toe that flares up before a storm. Treatment may also include dietary and lifestyle changes, and recommendations for vitamin and herbal supplements for a speedy recovery. Note :: Don’t self medicate. There are more than 150 Homeopathic medicines that can be right for your gout. The right remedy has to be chosen by a qualified physician to bring about an effective cure. Posted on October 1, 2016 February 9, 2017 by Dr. Renu MadanTagged arthritis, gout, gout tophi, homoeopathic medicine for gout, homoeopathic treatment for gout, homoeopathic treatment for high uric acid, inflammation joints.